Exterminating Angel Press, 9781935259299, 304pp. Bittersweet. Lush. Human. 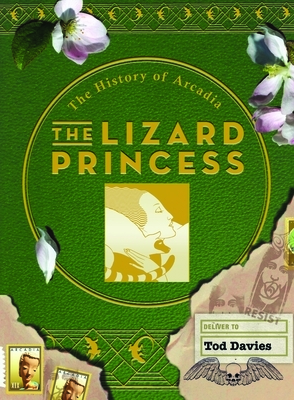 The Lizard Princess crosses mountains, oceans, deserts, and the Moon Itself to meet her fate and the fate of Arcadia on the Road of the Dead. Her reward is the Key that opens the door to the Domain of Life where wisdom trumps knowledge, as it should in all good tales about the world, whether Arcadia's, or our own. Tod Davies is the author of Snotty Saves the Day and Lily the Silent, the first two books in The History of Arcadia series, as well as the cooking memoirs Jam Today: A Diary of Cooking With What You've Got and Jam Today Too: The Revolution Will Not Be Catered. Unsurprisingly, her attitude toward literature is the same as her attitude toward cooking--it's all about working with what you have to find new ways of looking and new ways of being. Tod Davies is the author of Snotty Saves the Day, Lily the Silent, and The Lizard Princess, three novels from The History of Arcadia series, and the cooking memoirs Jam Today: A Diary of Cooking With What You've Got and Jam Today Too: The Revolution Will Not Be Catered. Unsurprisingly, her attitude toward literature is the same as her attitude toward cooking--it's all about working with what you have to find new ways of looking and new ways of being, and in doing so, to rediscover the best of our humanity. Davies lives with her husband Alex, and their two dogs, in the alpine valley of Colestin, Oregon. Illustrator Mike Madrid is the author of Divas, Dames & Daredevils: Lost Heroines of Golden Age Comics, Vixens, Vamps & Vipers: Lost Villianesses of Golden Age Comics, and The Supergirls: Fashion, Feminism, Fantasy, and the History of Comic Book Heroines, an NPR "Best Book To Share With Your Friends" and American Library Association Amelia Bloomer Project Notable Book. A San Francisco native and lifelong fan of comic books and popular culture, Madrid also appears in the documentary Wonder Women! The Untold Story of American Superheroines and is the illustrator of Lily the Silent: The History of Arcadia.